If you participate in discussion groups such as the Guardian's Comment is Free you will come across endless opportunities to present the case for LVT and you will be confronted endlessly with arguments against it. You have to defend the proposal against predictions that old widows will be thrown heartlessly from their homes; that England's green and pleasant land will become a sea of brick and tarmac; that the country's wildlife will be driven to extinction: that food will become so expensive that it will lead to mass starvation; that the country's economy will collapse; and so on and so on. I cannot see how that would work; I live in a street in Tower Hamlets where there are 16 listed Georgian properties worth probably >£450k each and then there is a 1920's block of 50 or so flats which takes up the same amount of land but each costs £200k a pop. As the houses are listed, we could not demolish them and build to the same density as the flats. Listed buildings in unpopular parts of a town are very difficult propositions in the first place; they would be totally stuffed under your system, wouldn't they? Note the tone verging on anger. That indicates that most sensitive nerve in the body, the pocket nerve, has been touched. But what is the reality in this instance? 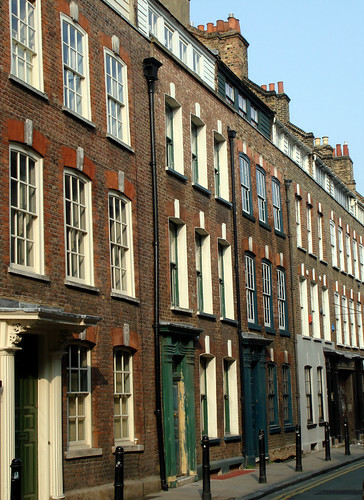 Houses like those this objector is referring to (Fournier Street, Spitalfields, above) have been lovingly restored over the last twenty years or so. The owners have spent fortunes on them with English Heritage checking constantly to make sure the work was as they wanted it. What would it cost to rebuild what what it was permitted to build? What is the value of the completed property ie site plus building? In this instance, the building would have to be replaced in accordance with the requirements of English Heritage. This would be exceptionally costly - perhaps three or more times that of a modern structure. But the valuer would take note of the attractiveness of the local environment: the ambience and associated prestige of a Georgian neighbourhood where the architecture had survived almost unspoilt and which was protected by strict regulations. The liability of exceptional building costs would make the site value much lower than if it was permitted to develop the site with a modern structure at the higher density allowed outside the Conservation Area. On the other hand, the attractiveness and official protection afforded to the architecture would enhance the land value. Restrictions and burdens on a site, such as the presence of a listed building, depress the value of the land. Advantages such as Conservation Area status push the value up. Both influences are reflected in the assessment and the tax payable. In fact, LVT would encourage the conservation of buildings which it was public policy to conserve. But under an LVT system, landowners pay for what they get, and get what they pay for.